Having built their nest over the vertical ventilation pipe of an old nuclear weapon bunker in Poland, every year a large number of wood ants fall down the pipe to never return back to their colony. Curiously, although trapped in extremely severe conditions underground, the ants have already upped their numbers to these of big, mature natural colonies, while also carrying on with their basic activities of nest maintenance, constructing and moulding. This unique population is described in the open access Journal of Hymenoptera Research by the team of Polish scientist Wojciech Czechowski, Polish Academy of Science. 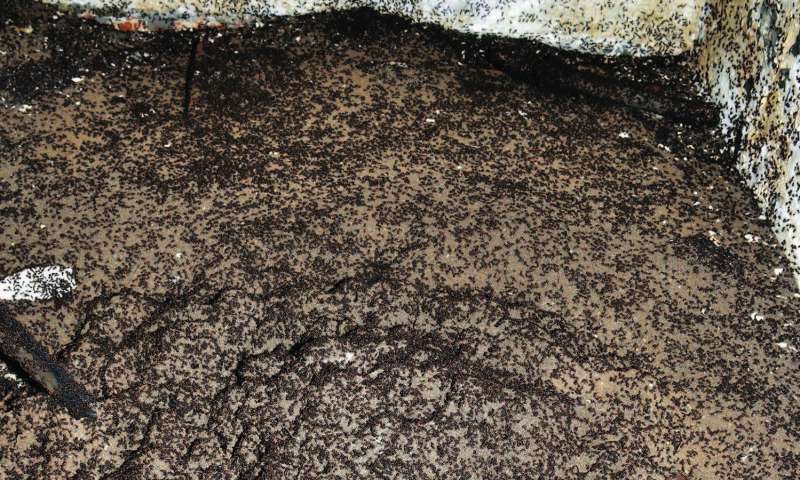 The studied colony is still unique, despite the fact that there are previously known similar cases, such as a black garden ant colony that found a home in a chassis of an immobilised car, where the insects had built their nest from mud and dry plant remnants stuck to the underbody. Another wood ant colony is known to have lived in almost complete darkness within a cubic wooden box with no openings apart from a narrow slit at the bottom of one side. Yet, unlike the ants from the bunker, they have all had access to the outside world, having deliberately made their own choice to settle in such extraordinary locations. Thanks to an yearly campaign set to count the hibernating in the same bunker bats, the ant population was discovered in 2013. Interestingly, when the ants were checked on in 2015, the researchers not only found the population still surviving, but even increasing its numbers. According to the estimates, they counted at least several hundred thousand workers, arguably close to a million. 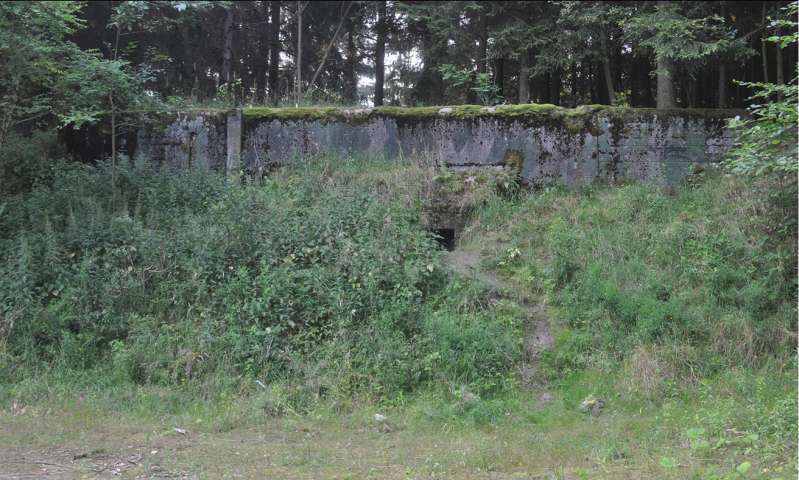 Moreover, when the researchers went back to the bunker in 2016, they found the mound's damage, caused on their previous visit, repaired, which showed the population still managed to maintain their nest almost as if they were leading a normal life. The ant 'colony' was found to have built an earthen mound in a small 2.3 m high room with a base area of 3 m x 1.2 m. Normally, such wood ants settle exclusively on large forested islands, where they can forage enough food to answer the high energy demand of the colony. However, the confined space within the bunker has not been the only obstacle the ants have been facing in their underground trap. Beside the lacking food and light, the 'colony' had to also deal with the low temperatures between the one-metre thick ferroconcrete walls. All year long it was no more than 10 °C. Understandably, the severe conditions within the bunker made reproduction effectively impossible. Although the scientists did undertake a special search for larvae, pupae, empty cocoons or queens, they found nothing. Nor did they find signs of male offspring. 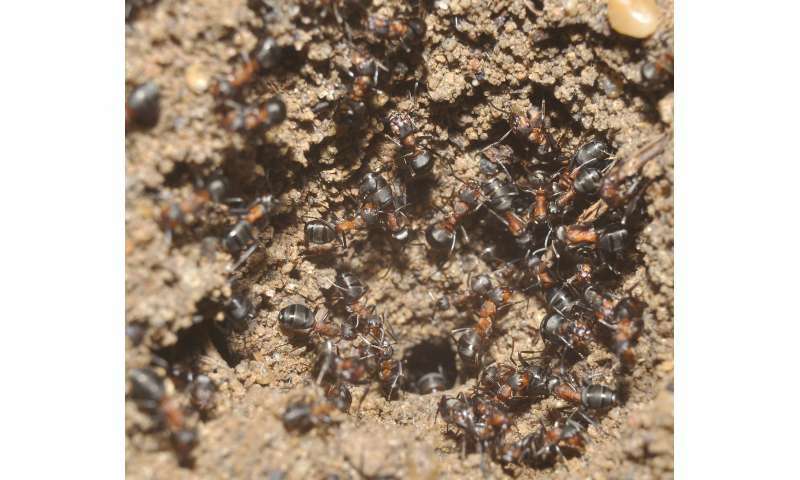 "To conclude, the wood ant 'colony' described here - although superficially looking like a functioning colony with workers teeming on the surface of the mound - is rather an example of survival of a large amount of workers trapped within a hostile environment in total darkness, with constantly low temperatures and no ample supply of food," say the authors. We are all still trapped in nuclear bunkers. The fear, the hate, the distrust, the ideation has not gone away. As usual george kamburoff is incapable of talking about anything but himself. "Psychopaths dominate and set the standard for behavior in our society. We live in a world based on a psychopathic, energy stealing food chain, because that's just the way things are. Most people are so damaged they no longer have the capacity to even imagine a different system based on a symbiotic network." -What a trendsetter you are.